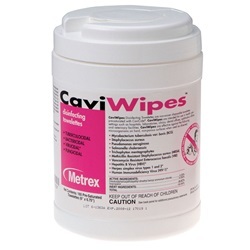 CaviWipes multi-purpose disinfectant wipes measure 6 x 6.75 inches. Comes in a pull-up canister manufactured by Metrex Research. 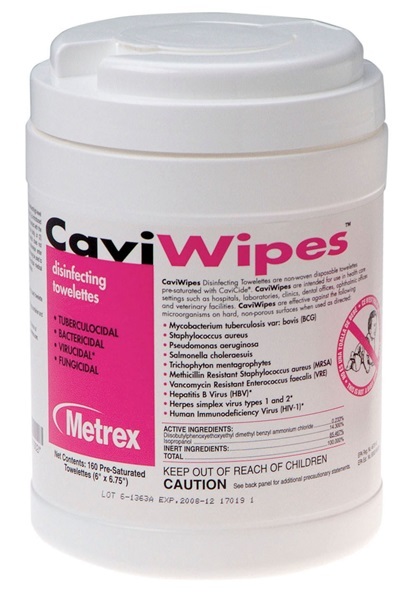 Comes 160 wipes per canister. Effective against both TB and HBV. Towels stay fully saturated and will not dry out during use. Sturdy, durable, non-woven towelette will not bunch up during use.